Hail mason bees, Osmia spp. - Harbringers of Spring! Blue orchard mason bees are early season pollinators of some of our most important fruit crops, like apples and cherries. Last week we visited the nefarious Brown Marmorated Stink Bug as it exited our homes to plunder our plants outdoors. Ah, but stink bugs are not the only insects responding to Mother Nature’s wake-up call to summer-like weather. One of the true delights of spring is the return of solitary bees. 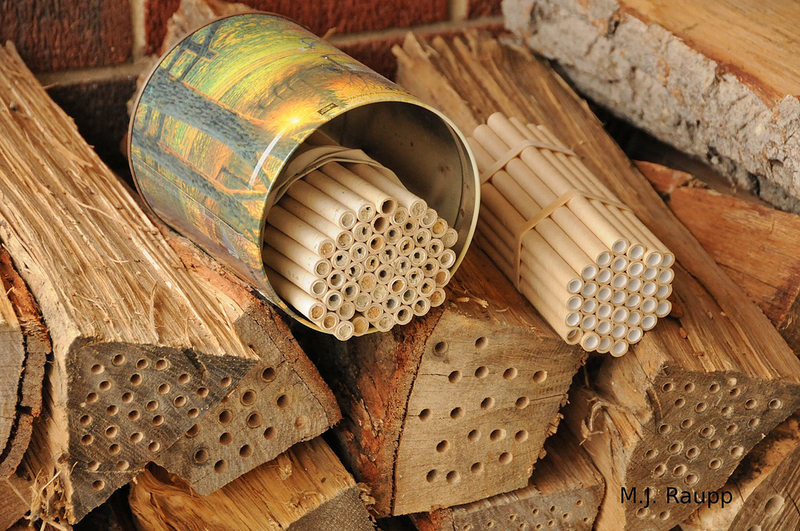 Several years ago I established a colony of mason bees by purchasing about 30 hollow cardboard tubes from a purveyor of bee paraphernalia. These tubes were rapidly occupied by grateful hordes of mason bees. Each year I have augmented my colony by drilling dozens of small holes in unused splits of maple and oak firewood. The bees have happily obliged by filling every gallery until my colony now numbers hundreds of bees. With uncanny timing, the masons reappear each year within a day of the vernal equinox, March 21. This spring my first mason bee, a small male named Wilbur, emerged on March 9, a full 12 days in advance of the perennial average. Over the past weeks, as the morning sunshine warmed the tubes and logs, earthen plugs were dismantled as bees set themselves free from juvenile confinement. Like many of their kin, male mason bees complete development and emerge several days in advance of their future mates. This phenomenon, called protandry, is relatively common in the insect world and was noted by Charles Darwin in his famous work, "The Descent of Man." It seems that female mason bees are a highly sought after commodity and males that emerge early in a season have more opportunity to find and secure mates. Males that are slow to develop and emerge late may find all of the available ladies taken by earlier suitors, and ultimately be losers in the bee mating game. I was not surprised to see one of the first females to appear quickly captured and guarded by an eager male bee. Mason bee larvae consume pollen cakes prepared by their mother. In addition to being highly entertaining, mason bees provide valuable ecosystem services by pollinating a variety of native flowering plants and some that bear many of my favorite fruits and nuts such as apples, cherries, blueberries, and almonds. Mated female mason bees spend busy days gathering pollen and nectar from which they fashion pollen cakes. The future mamas then fill the cardboard tubes and wooden galleries with pollen cakes. Before each cake is sealed in a chamber, the female mason bee deposits an egg on it. Eggs hatch into tiny bee larvae that consume the cake as they develop and grow during summer and fall. They complete development during autumn, hunker down for winter, and are ready to emerge just in time for the return of spring. Like many other bees we have met in Bug of the Week, mason bees are gentle and not at all interested in stinging humans. I handled several adults and received a couple of cautionary bites, but never a sting. Nesting materials for mason bees can be purchased commercially and I highly recommend creating habitats for these fascinating native pollinators. The mason bees foretell an early spring and, perhaps, a banner year of bugs. This episode was inspired by Lee Hellman who supplied the tubes for our original mason bee colony. References included “Bee Pollination in Agricultural Ecosystems” edited by Rosalind James and Theresa L. Pitts-Singer, and “The significance of protandry in social Hymenoptera” by M. G. Bulmer.